Happy BARD Day – January 2019 was a great month for downloading audio and braille. In January 646 audio readers downloaded 8516 books, 434 magazines and 28 music items. 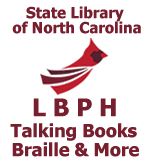 Another 22 braille readers downloaded 2170 books, 47 magazines and 1 music item. 16 more people signed up for BARD. BARD Mobile added 66 new users and 69 new mobile devices. Do you BARD? If not, what’s keeping you? With the BARD Mobile app added to things you now have another great way to read your books and magazines on the iPod Touch, iPhone, iPad, Android devices and Amazon Kindle Fire. This entry was posted in BARD, braille, Digital Magazines, talking books and tagged android-app, audiobooks, BARD, BARD Mobile, blind, books, braille, digital, downloadable magazines, downloading audio, happy BARD day, iPad app, iPhone app, january reading, kindle app, libraries, library, music, nc libraries, nclbph, News, North Carolina, north carolina library, North Carolina Library for the Blind and Physically Handicapped, reading lists, talking books. Bookmark the permalink.